Catherine "Cady" Coleman, Ph.D. is a NASA astronaut – a veteran of two space missions, who has logged over 500 hours in space. She is assigned to the Expedition 26 crew and is scheduled to fly to the International Space Station aboard the Russian Soyuz 25 in late 2010. Below is a blog written by Cady exclusively for CNN via NASA's Astronaut Office. 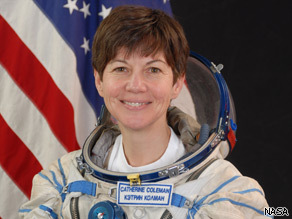 NASA astronaut ''Cady'' Coleman has logged over 500 hours in space. Here’s how I look at it: The space program belongs to all of us – I just happen to be one of the lucky ones who will be sitting on top of the rocket when it launches! My name is Cady Coleman. I’ve flown twice on the space shuttle, but over the next year or so, I’ll be getting ready for a 6 month mission aboard the International Space Station. I'd like to invite you to come along with me as I get ready to launch to the ISS – on a Russian Soyuz rocket from Kazakhstan in late 2010! I think that an important part of a space mission is to share it with people around the world, and that includes sharing the training that leads up to the mission. It is easy to think that astronauts just wake up one day, throw on a space suit, climb into the nearest rocket and launch off into space. I’d like for you to understand some of the nuts and bolts of what it takes to get ready for a mission, and to know what it is like for me and my family on the personal front as well. The folks at CNN were having similar thoughts as they contemplated the changing face of the space program with the upcoming retirement of the space shuttle. Until the replacement vehicle is built, astronauts bound for the space station will be launching on the Russian Soyuz from the Baikonur Cosmodrome. That’s a journey that few have seen, and I’m excited to be working with CNN to make it real for you. They are planning a series of monthly updates on my training and I’ll be trying to add my perspective through blogs, photos, and video. Through our stories on CNN and the Web site, I hope you’ll get to know my husband Josh Simpson, our 9-year-old son Jamey and my stepson Josiah. You’ll also meet a host of others that make up the village that keeps my head above water as I make my way toward the launch. November was the formal start of my training for Expedition 26 to the ISS. I’ve already trained as Nicole Stott’s backup for Expedition 20, but now that she is safely on orbit, it is time for my crew and I to start preparing for our own mission in late 2010. I’ll be flying to the ISS in a Soyuz with Dimitri Kondratyev from Russia, and Paolo Nespoli from Italy. Dima (short for Dimitri) is the commander of our Soyuz vehicle and Paolo is flying in the left seat as the primary flight engineer. My training for the right seat of the Soyuz is significantly less than theirs, but still involves a lot of time in Star City, Russia. We have all known each other as hallway acquaintances for a few years, but now we’re a crew – and we will spend 6 months together aboard the station. I’m looking forward to showing you what it is like to train in Star City, where spaceflight is a way of life for most of the people that live there. I’ll also be taking you along to Japan and Germany, where we learn how to operate the modules of the space station that were built there. In addition, I’ve traveled to Canada to learn how to fly Canadarm2. This is the robotic arm that enabled us to build the international space station and that we will use to ‘catch’ our supply vehicles and attach them to the space station. Dima, Paolo and I will join the crew of Expedition 25 to make a crew of 6 people total on the space station. Then, a few months into our mission, the Expedition 25 crew flies home, Expedition 27 comes aboard, and we have a crew of 6 again. There is a lot to learn in the next year, about the space station, the Soyuz – and about each other! November 30, 2010 may seem like a long way away, but for me and my family – it is just around the corner! I’m hoping you will come along on this special journey. Over the next year, I’ll try to cover the things that I think are important and interesting, both technical and personal. Until launch, we’ll talk about how I get ready and then once I’m up there – we can talk about what it is really like to live in space! Program Note: Watch CNN's American Morning as we follow Cady on her year-long mission to space, and check back here for blogs, photos and video updates from Cady as she documents the behind-the-scenes life of an astronaut.